The Irish Dairy Board’s (IDB) Production Price Index (PPI) for March was down on the February return, but significantly remains 14% per cent higher compared to the same month last year. The Index had been stable for the three months prior to March with the return more or less flat over the period. This follows on from a fantastic 2013 for dairy returns with the index having only fallen once since January 2013. 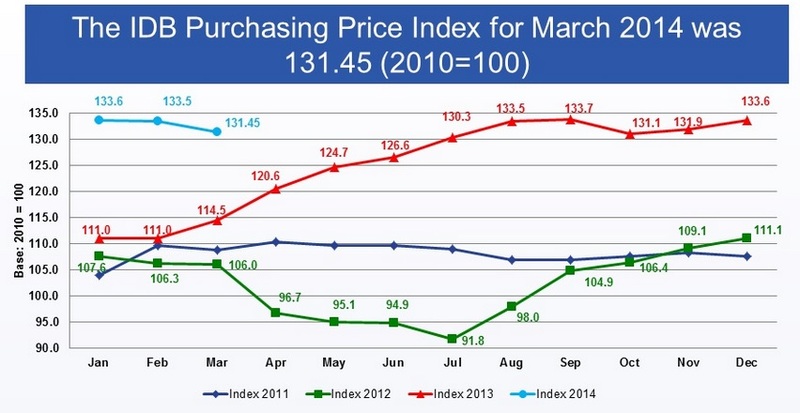 The IDB released its monthly PPI this morning. The index showed a return value of 131.4, which indicates a 31.4 per cent increase in market returns when compared to 2010. January of last year saw the index start the year at 111, the index rose significantly over the spring and summer months peaking in September at 133.7. The fall in the PPI index is also reflexed in EU wholesale dairy prices. Which according to DairyCo are starting to fall as milk production continues to perform well. There is indication that buyers are limiting cover to short term requirements, waiting to see what impact the flush will have on prices before committing mid- to long-term. The euro strengthening against the Dollar has also contributed to prices falling as EU exports become less competitive on world markets.